Thisfunktional is holding a contest to win seats to an advanced screening of "Bohemian Rhapsody." October 30 at 7:30 p.m.
To enter you must be subscribed to my YouTube channel: Thisfunktional and follow instagram.com/Thisfunktional and email me your full name and mailing address with the subject line #ThisfunktionalContest #BohemianRhapsodyMovie to Thisfunktional@Gmail.com. Disclaimer: Winners will be chosen randomly. Contest runs to October 25. 2018 11:59 p.m. PST. No purchase necessary. Prize provided by 42 West. Only open to the U.S., no PO Boxes or international addresses. Only one entry per household. Entries on behalf of another person will not be accepted and joint submissions are not allowed. We will not accept entries of contestants who have claimed a prize in the last 6 months. 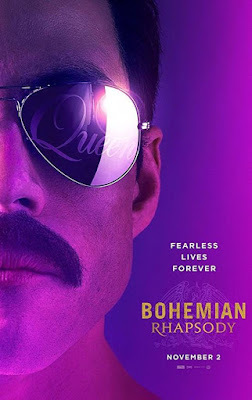 "Bohemian Rhapsody" is a foot-stomping celebration of Queen, their music and their extraordinary lead singer Freddie Mercury. Freddie defied stereotypes and shattered convention to become one of the most beloved entertainers on the planet. The film traces the meteoric rise of the band through their iconic songs and revolutionary sound. They reach unparalleled success, but in an unexpected turn Freddie, surrounded by darker influences, shuns Queen in pursuit of his solo career. Having suffered greatly without the collaboration of Queen, Freddie manages to reunite with his bandmates just in time for Live Aid. While bravely facing a recent AIDS diagnosis, Freddie leads the band in one of the greatest performances in the history of rock music. Queen cements a legacy that continues to inspire outsiders, dreamers and music lovers to this day.